Every sport carries a mythology, and every fan knows their sport’s legends and tall-tales. Babe Ruth calling his shot. Michael Jordan playing through a stomach flu and posting 38 in an NBA Finals game. The final plays in Super Bowl XXXIV. We all have, or at least have heard of, these moments, even though they strain credulity—you almost had to have been there to know they really happened. 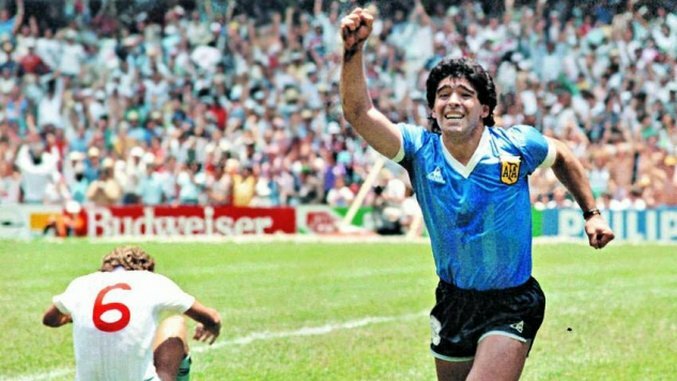 This week, we look back at the 1986 World Cup, and the day that God reached down towards Diego Maradona. There really isn’t much of a set-up I can write that either tells you something you didn’t know already or does the occasion justice. You know most of the important bits; England and Argentina developing a fierce football rivalry in the wake of the Falklands War; Maradona looking for redemption with Argentina after a crushing loss to Brazil four years earlier, a game in which he got himself sent off for violent conduct; the 1986 World Cup being moved to Mexico after Colombia had to beg out for economic reasons. You know all this already. The ESPN documentary does a superb job of setting the stage, and anyway, you get to hear the story set to Wagner, which is probably the only way appropriate soundtrack for something like this. So, it’s like this. It’s the Azteca. It’s the 50th minute of the World Cup quarterfinals and it’s scoreless. Maradona hits a low pass to Jorge Valdano from the left. He continued his run, anticipating a quick one-two to catch the English flat-footed. The pass is just a few inches off and slides behind Valdano. Steve Hodge catches it and tries to clear it. But he doesn’t get his footing right, and ends looping it into the box. Maradona kicks on the afterburners to get to the ball before Peter Shilton does. They’re milliseconds apart, but Shilton has a height advantage and should’ve cleared it. But Maradona got there first. What happened in that precise moment depends on how you tell the story. Maybe Maradona hit it with his head. Maybe he hit it with his left hand. Or maybe, just maybe, Maradona was right when he said later that the goal was scored “... otro poco con la mano de Dios.” Maybe God does exist, and, for one day at least, She was Argentinian. The referee didn’t see the hand. Maradona ordered his teammates to hug him, or else they won’t award the goal. England players cried out, in vain. Argentina 1-0 England. 51st minute. Less than five minutes. That’s all it took to create something we still talk about. Something that’s as much a part of our collective mythology in football as anything could be. Maradona had this to say after the World Cup ended and Argentina emerged as champions. How important that game was in the greater scheme of things depends, I think, on how much stock you put into the transformative power of stories. Because that’s all those five minutes that ticked by 30 years ago are anymore. People say they love sports because the “story” never ends, it just keeps going and the cast turns over, but of course that’s not true. People die. Teams move to different cities. Leagues fold. One day the sun will consume the earth and no one will remember what you or I do today, much less what Diego Maradona did on a hot June day in Mexico in 1986. Even if you were at the Azteca that day, the moment is just foam on the tides of memory. Stories always have an ending. But stories give a framework to organize and interpret our lives. They give us context. They give us the feeling of being part of something bigger, even if it’s an illusion. They can lift up marginalized voices or silence them forever. They give us hope in our dark places. They give us history and continuity. This weekend, Argentina will line up to try and recapture the spirit of 1986, if not the grandeur, when they take on Chile in the Copa América Centenario Final. For a team that’s been to two major tournament Finals in a row (and lost both of them), Argentina will be in search of some measure of redemption. They always seem to be.